The Circle of Time Ketubah - The seasons, flowing and merging into each other between the four corners of the painting, show the yearly cycle of spring flowers budding and blossoming, summer fruits swelling with richness and juice, autumn leaves turning from fresh green to fall flames, and finally, winter's bare branches covered with frost. But the bare branches gradually bud again, the buds blossom, and Nature's never-ending cycle of hope and renewal continues. The cycle of the night and day calls to mind Psalm 19: " the heavens declare the glory of God, and the firmament showeth His handiwork; day unto day uttereth speech, and night unto night revealeth knowledge". It shows the sunset, the sunrise, the moon and stars, and the sun, "as a bridegroom coming out from under his canopy" (Ibid,19, 6). 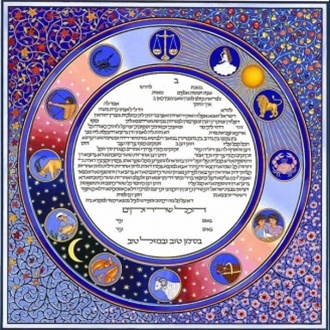 The cycle of the months is represented by the Zodiac, which may also suggest certain values and blessings for the marriage, for example: balance (Tishrei); brotherly love, peace and friendship (Sivan); strength and action (Kislev, Av); softness and tenderness (Nisan); youth and purity (Elul); fruitfulness (Adar); hard work (Iyar); and growth and renewal (Shvat), blessings which may counter and overcome the dark forces of life (Cheshvan), the inescapable cold of winter and the darkness of night. Our ketubot are available in a variety of texts and the options are listed with each ketubah listing. You should choose the one that best reflects your own beliefs and worldview. It would be wise to get your rabbi's or officiant's approval before ordering your ketubah. This text is a prenuptial agreement between the groom and the bride wherein the husband undertakes to honor, support and maintain his wife. In the document he states that she will receive a certain sum of money in the event of divorce or of his death. It is a very formal contract written in Aramaic over 2000 years ago. There is no English on this text. This text is the same Aramaic document as above. The traditional English portion is NOT a translation of the Aramaic, rather a brief paraphrase. This text is almost the same text as the Traditional Aramaic. A new clause was added essentially stating that in the case of a civil divorce, either the husband or wife can appear before the conservative Bet Din (rabbinic court) to request a "Get" (a Jewish divorce document). According to Jewish law, without this document, a woman is still legally married to her husband. Some Conservative Rabbis require the Lieberman Clause text to protect the woman in the unlikely event that a man refuses to grant her a "Get". The English portion is NOT a translation of the Aramaic, but rather a contemporary text. This text is suitable for reform and conservative marriages. The text reflects an egalitarian view of marriage and the equal roles of a husband and wife in our contemporary Jewish society. This text is designed for couples from different heritages. The language is gender neutral, so as to accommodate both Judaism and the other religion. It contains the specific information as to names, place and date of wedding, etc. and contains mutual vows of love and commitment. This text is designed for couples celebrating an anniversary from 2 years to 70 or more years. It records the bride and groom's original wedding and does not need to be signed. Since the tradition of using an illuminated ketubah has been re-introduced into the ceremony only 10 to 15 years ago, many couples who have been married for more than 10 years never had a beautiful ketubah. They are now either deciding to purchase a ketubah for themselves in order to renew their vows, or they can receive one as a gift (often from their children). This text is suitable for reform, humanistic, different heritages and special partnerships. The Hebrew is a direct translation of the English. The signature lines have been left off because we fill in this portion of the ketubah when we personalize it according to the specifications of the couple. Most couples opt for the standard signature lines (2 Witnesses, Bride, Groom, and Rabbi), but some people want the word "beloved" instead of bride and groom, or the word "Officiant" or "Cantor" instead of Rabbi. We're delighted you are considering this special item from Alljudaica.com! Because it is a special item, we will be calling you back to confirm details before final processing. We want to make certain your order is perfect! Please make sure to enter your contact information accurately during the checkout process.